Test different options when considering choosing a shaft that will meet your needs on the course. Selecting the correct shaft is just as important as selecting the right model of golf club. Key things to take into account when looking at a shaft are the length, flex, kick-point, material, and weight. Choose the club that feels best and performs well, even if its not the most popular or expensive model. Decide on the general type of shaft you are looking for. The most common irons are graphite and steel, though multimaterial, nanofuse, and titanium shafts are also available. The most common driver choice is graphite, however multimaterial, nanofuse and titanium shafts are also used. Go to a store or golf course where you can demo clubs. Attain a wide variety of shafts on clubs that are as similar as possible to reduce the number of variables, then head to the range to try them out. A lighter, more flexible shaft allows for longer shots, while stiffer, heavier shafts reduce distance but make it easier to hit the ball straight. 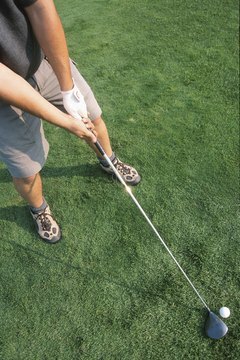 Shafts with a higher kickpoint will result in a shot with a lower trajectory. After warming up, hit five to 10 balls with each shaft. Narrow the selection by removing any shafts you didn't like and continue. Continue to hit with each club and narrow down the candidates until you feel you have found the correct shaft.